Best Toy Guitars for Kids! I Found the Cutest Toy Guitars for Kids!!! Does your little girl dream about being the next Hannah Montana? Does your little boy dream about being part of the Jonas Brothers band? The best way to encourage your little ones to pursue their passion for music is to give them a toy guitar from an early age!! Don’t let their dream die! The gift of music is the best gift you are ever going to give your child! If you see they are interested in learning how to play the guitar, by all means start them off with a cute and colorful toy guitar! I gathered here some of the best toy guitars for kids! The Gift of Music: How to encourage children to play an instrument! Best Kids Guitars for Sale! I have always loved music! But my parents always had a record on, (yes I am that old!) so I was exposed to music ever since I was born! The best way to encourage your little ones to want to play an instrument is to expose them to music! Sing with them, play different styles of music and if you play an instrument, play for them! This is one of the best beginner guitar starter packs for kids out there! It comes complete with everything needed for them to start playing their guitar! It is perfect for children between 6 and 10 years old! Gorgeous Butterfly Shaped Electric Guitar for Girls Ages 6 to 10 Years Old! I had never seen a butterfly shape guitar before! What a wonderful Christmas gift idea for your future rock star! A happy buyer said it was a great gift for his 6 year old girl! It is lightweight, fun and ultra-cool! Cute Hello Kitty 30″ Acoustic Guitar for Girls! This is one of the cutest guitars for little girls in my opinion! Perfect for a 6 year old child beginner! 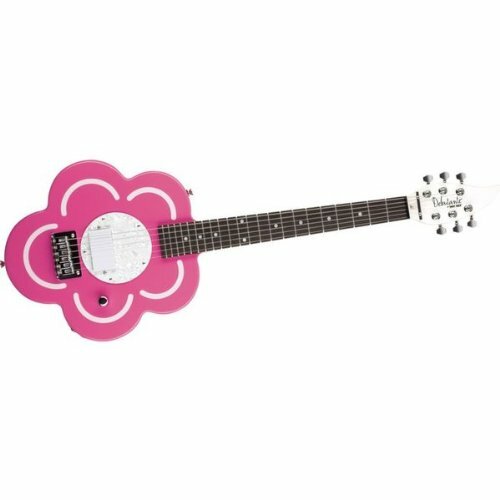 Adorable Flower Shape Electric Guitar for Girls! It’s a flower shaped guitar! This electric guitar is so very cute!! Your little girl is gonna rock!! Beautiful Red Heart Shaped Electric Guitar for Girls! Cute Red Heart Shaped Electric Guitar for Girls! Cute and perfect for little girls with small hands! 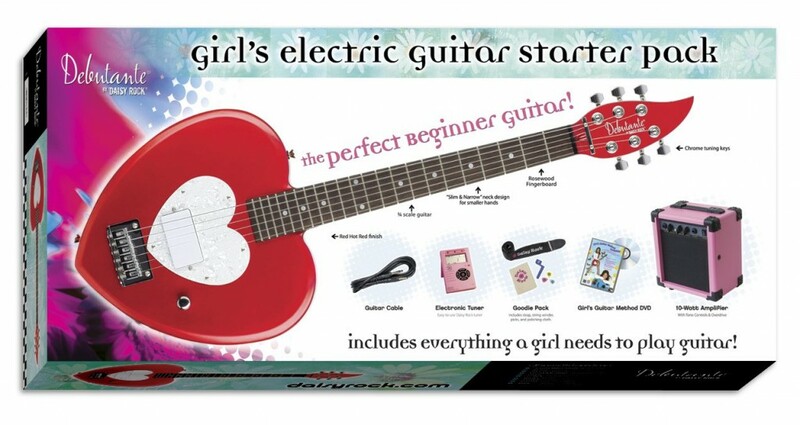 Is there a more fun way for little girls to want to learn how to play the guitar than with their very own red heart-shaped cute and lightweight easy to hold guitar? Very Cool Toy Electric Guitar for Boys Ages 7 and up! Cool Toy Electric Guitar for Boys! This is a super cool teaching guitar! Just follow the cool lights and strike those chords! Boys will learn how to play six rock classics right away! Your little boy is gonna rock the town playing this awesome white guitar with built-in lessons! With lots of great reviews by happy parents, they say it’s fun and perfect for kids of all ages, even 11 and 12 year olds too! They love the fact that it comes with 12 songs already, that help the child learn by practicing all the chords first and then strumming along! Daisy Rock Pixie Acoustic/Electric Sparkly Guitar! This pink and “sparkly” guitar is one of my favorites!! It will be perfect for your little girl!! We girls love sparkles and glitz! It is fun and very lightweight to hold! Great child guitar for girls between the ages of 7 and 11 years old! Perfect Christmas gift idea for girls interested in learning how to play the guitar and starting lessons soon! Cute Purple Guitar for Girls! 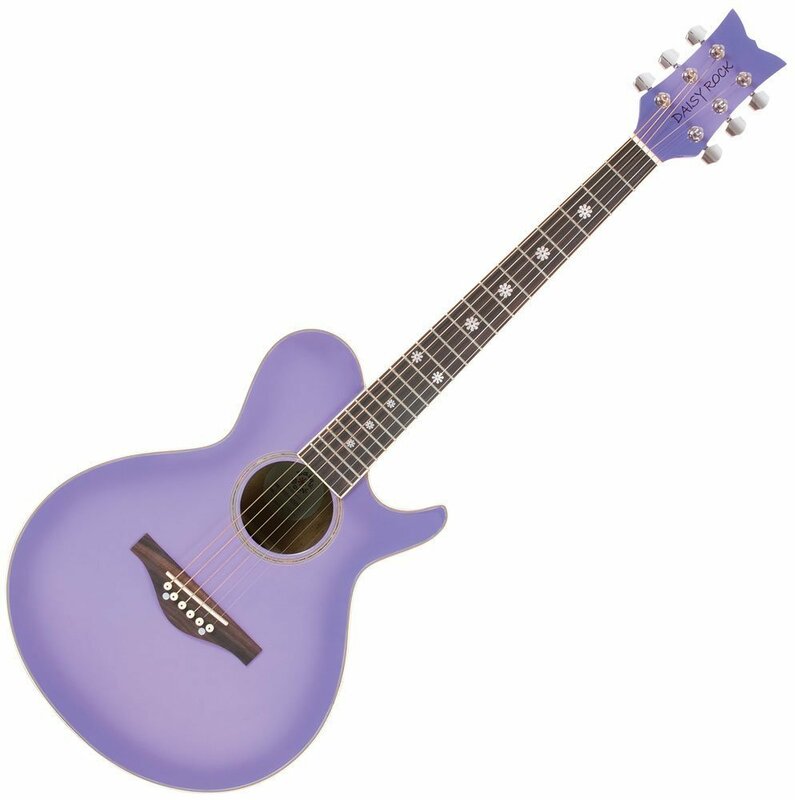 If your little girl’s favorite color is purple, this gorgeous purple guitar will be perfect for her! Let her discover how wonderful making music is! Great starter guitar for girls ages 6 and 7 until 12 years old! High quality and comfortable to hold! We all know that colors have power! By choosing a fun and colorful guitar for your child, it will make them want to play even more! Just imagine your little girl playing her purple acoustic guitar for the whole family! 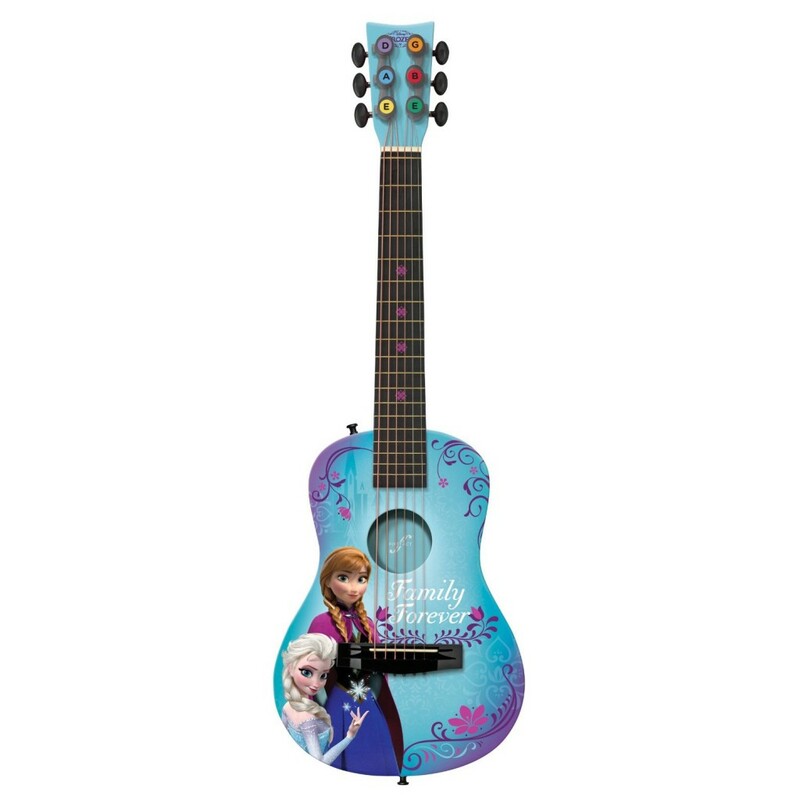 Disney Frozen Acoustic Toy Guitar for Little Girls! Best Toy Guitars for Children! It is a Frozen themed acoustic guitar for little girls! Your little girl will want to learn it super fast and play for all her friends! Low string action means easy playing for beginners! Perfect for 3, 4 and 5 year olds! 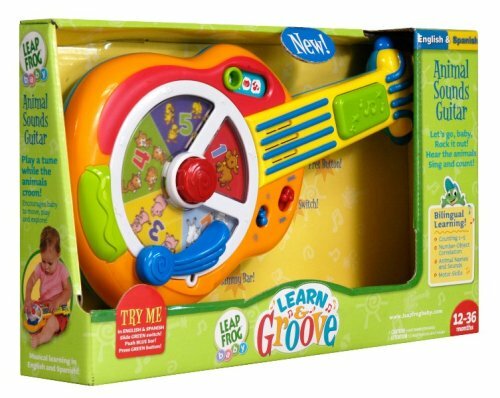 Very cute and and very educational toy guitar great for babies and toddlers! Great way for them to start working on their coordination skills while ‘playing’ music! They love to push all the fun buttons and find out that they can make music happen! They can also learn numbers, animal names and sounds and even objects in English and Spanish! 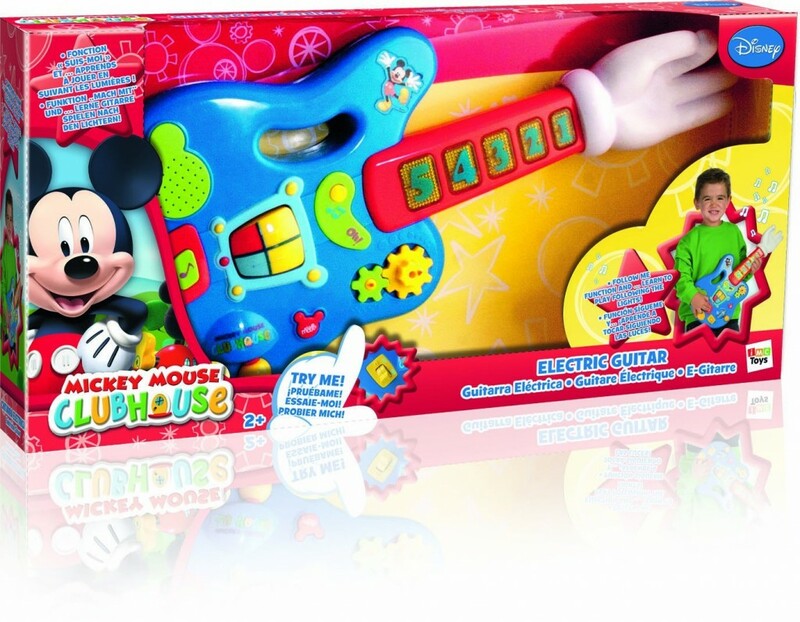 Fun Mickey Mouse Electric Toy Guitar for Toddlers! Best Toddler Guitars for Sale! Cute Mickey Toy Guitar for Toddlers! How cute, colorful and beyond adorable is this Mickey Mouse toy guitar? Now it’s time for this fun and very colorful Mickey Mouse toy guitar for kids! Mickey is gonna help your little one become a rock star! It plays 10 fun songs! You are gonna love to see your little ones dancing and having fun when it starts playing music! 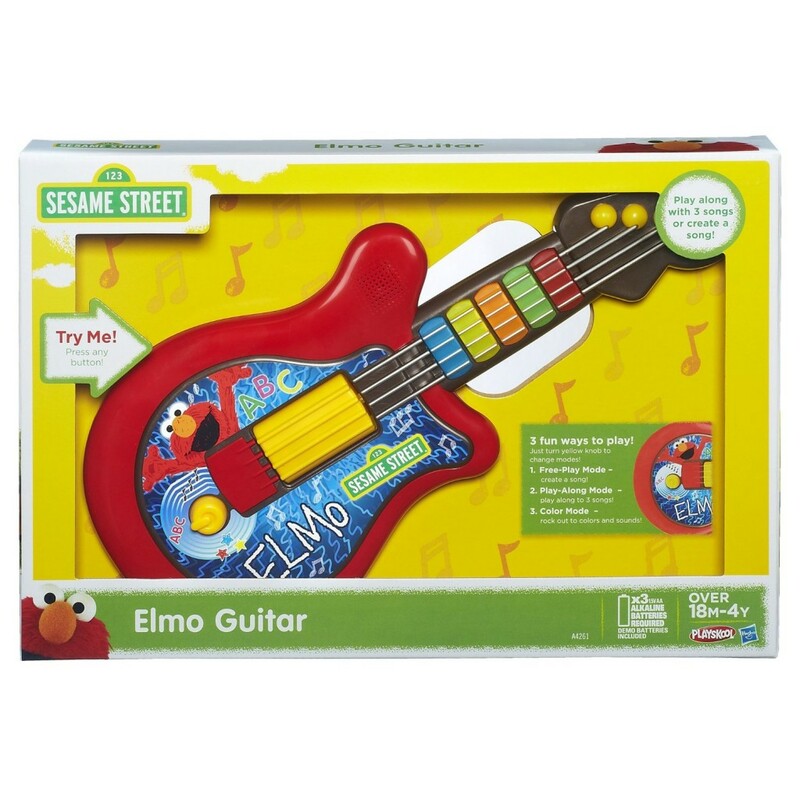 Cute Sesame Street Elmo Guitar for Toddlers! How about this fun Sesame Street toy guitar? Great for kids ages 1 to 4 years old! Parents say it’s noisy, (which kids love! ), cute and fun! They love when it lights up when the music starts playing! It plays 3 fun songs! Pink Acoustic Guitar for 3 Year Old Girls! 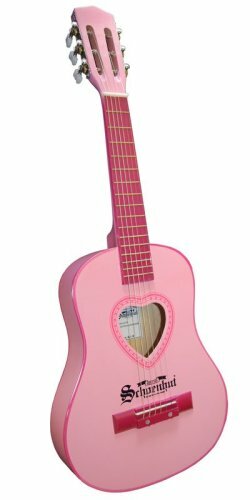 Cute and adorable pink guitar for little girls ages 2 to about 6 or 7 years old! It’s never too soon to have children start playing an instrument! Great guitar lesson for children! How to teach them to play! It could be your child soon! Check out these amazing toddler pianos too!